Lieutenant Cooper didn’t complain when I followed him and his sergeant to find the HQ for which ever unit was there. It was our sister company in the 389th Regiment. Their Captain Charles Harrison, of New Orleans, Louisiana, said it was good to see us. His modest Cajun drawl was welcoming. As the officers talked, runners went to grab boxes of machine gun ammo and rifle clips which were passed on with a quiet “good luck.” Conversation was interrupted several times by low flying aircraft, each time a single Navy fighter-bomber, flying low under the persistent clouds. We got directions to head roughly west on a local road. It was covered by a line of hills to the right, out of enemy view, until the point where we should meet our own division. For the next hour we marched, still under assault packs, until nearing the end of the last protective ridge. We faced a broad shallow valley. Nothing moved in the valley, except the occasional cloud of dirt kicked up by an exploding artillery shell. Across the valley I could make out American soldiers and trucks, moving back southwest along the base of the hill which defined the valley between us. Vehicles had struggled to move over the soaked earth, more than one was abandoned in axle-deep mud. An occasional heavy shell streaked from left to right, probably from our Navy gun ships. 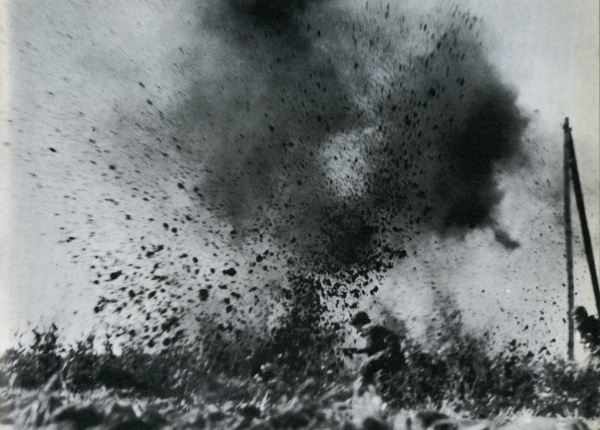 Smaller rounds moving from right to left, from Japanese cannon and mortars, could not be seen until they exploded. Lieutenant Cooper wanted a better look. He took a sergeant a ways up the hill next to us to get a better view to the north. He stood up tall at the crest, pointing and talking while looking through his binoculars. One minute after that the earth shook all around us, trying to swallow the entire platoon. Veterans instinctively threw themselves against the adjacent slope. Sergeants and corporals screamed at their charges to follow suit and get cover behind the hill. The violence of heavy exploding shells defies description in terms any adult knows. The whole earth, the fundament upon which all our plans begin, is ripped apart and shot in all directions. To understand when something one has always relied on to suddenly be gone, one must try to remember the helpless fright of a small child. Almost anything can be terrifying to a person who hasn’t yet learned about the supposed permanence of the world around him. The large artillery that terrorized us thankfully diminished quickly, but soon after it high trajectory mortar rounds fell close behind the hillside. We gathered up into a decent line and crawled up the ridge line toward the top, but not exposing ourselves like the looey, who was still curled up in a ball near the crest.